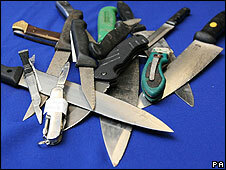 An exam board is removing a poem about a knife-carrying violent loner from its anthology for GCSE English because of fears over teenage knife crime. The AQA exam board has decided to withdraw the poem Education for Leisure written by Carol Ann Duffy. The exam board is writing to schools to advise them to destroy the copies of the anthology - and says it will send replacements not containing this poem. The poem begins with the line: "Today I am going to kill something. Anything." It describes the thoughts of a disturbed, isolated individual who feels underappreciated and undervalued and who kills a fly then a goldfish. The poem concludes with this angry loner going outside with a bread knife. Why should learning be censored because of the minority who go around brandishing knives? Some teachers have been complaining for years about the poem's inclusion in the anthology. The exam board said the poem had been a "popular choice" for pupils - allowing GCSE English students to debate issues about the state of mind of the poem's narrator. "People will have different views on this - but we have to make a decision in the light of what is currently happening," she said. The exam board said the decision had not been taken lightly but that the selection of poems had to respond to current "social issues and public concern". Carol Ann Duffy's literary agent, Peter Strauss, told the BBC's iPM programme that the poem was not a promotion of violence. "This poem is pro-education and anti-violence. It is not glorifying violence in any way," said Mr Strauss. "Carol Ann Duffy is a vocational poet for the young. She gets children fired up about language and verse. She talks to more schoolchildren than I've ever met. She's encouraged more people to have a love of words and a love of education than anyone else I know," said Mr Strauss. The AQA anthology includes several other poems by Carol Ann Duffy and a selection of work by modern writers Seamus Heaney, Gillian Clarke and Simon Armitage and earlier poets including Yeats, Wordsworth, Shakespeare, Tennyson and Blake. BBC Radio Four's iPM will have more on the subject on Saturday 6 September at 1730 BST.